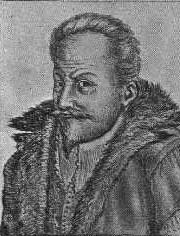 Heinrich Khunrath was a German physician and alchemist. He was probably born in Dresden or Leipzig in 1560. He studied at the University of Basel, Switzerland, and subsequently practiced medicine in Hamburg and Dresden. He is the author of The Amphitheatrum Sapientiae Aeternae (The Theater of Eternal Knowledge), which includes a stunning series of allegorical alchemical drawings. It was first published about 1595 in Hamburg. Khunrath's motto, which appeared in many of his published works was, "What good are torches, light, or spectacles, to those who will not see?" An extended written selection by Khunrath entitled "The naturall Chymicall Symboll or short Confession of Doctor Kunwrath"
A pretty good online biography of Heinrich Kunrath.